These are beginning to replace single-flush toilets (>10 litres per flush). The current standard dual flush toilet uses 6 litres on full and 3 litres on a half flush. Low-water-use urinals are being operated with sensors which detect the presence of people. Taps are now available with aerators which help save water and reduce splashes. These systems, which can be retrofitted to taps, spread the water flow, while providing the same flow regardless of pressure. Water efficient showerheads are now available in the market which can deliver reduced flow rates at 9 litres per minute or less, without compromising the bath quality. Please send more particulars about Water less urinals, Aerator taps, efficient showers. I am a member of Lions Clubs International, District 316A, District Chairman : Water Man agement. 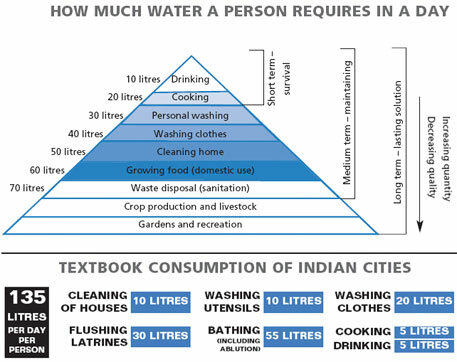 Enormous amounts of water is wasted in Indian homes and other places for cleaning floors and cars etc. Further, those with BATH TUBS (whether homes or hotels) should be levied heavy charges as huge quantity of water is used as also discharged in the already choking drains. How about levying Water Tax not for usage but on the basis of pollutants and discharge quantity? How can we reutilize waste water from washing machines? If it can be used in watering plants?